The release of the movie Black Panther was notable in a number of different ways. First, it was one of the the first superhero movies to feature a black man in the primary superhero role. The movie was also the first superhero movie to have a majority black cast, and its incredible box office success (it was the highest earning movie made by Marvel in the United States of all time) smashed ago old stereotypes about casting people of color in movies and taking a hit in sales in return. Black Panther has been nominated for a large number of Academy Awards, including Best Picture, Best Original Music Score, Best Costume Design, Best Sound Mixing, Best Production Design, and Best Sound Editing. It drew attention to a multitude of issues facing the black community today, and more specifically, the African community: the idea that all of Africa is third world and impoverished and therefore needs assistance from majority white countries, and the historical exploitation of the African people for goods and services by villainous characters like Ulysses Klaue (although we will admit there is not historical evidence of anything like vibranium, we are sorry to say). And best of all, the Black Panther movie created a whole new legion of black role models for black boys and girls to look up to. Thanks to T’Challa and the people of Wakanda, black people can also be super. And you know what that means: no superhero action figurine collection or child’s superhero toy chest is complete without representation from T’Challa and the rest of the Black Panther cast of superstars. Thankfully, there are plenty of options out there to satisfy even the most picky collector’s dreams. T’Challa’s superpowers as the Black Panther include a lot of superpowers that pay homage to his superhero alter ego’s name: like a panther, he has incredible hearing and sensing abilities, in addition to notably faster reflexes. He also boasts superhuman strength (can you even find a superhero without superhuman strength? ), and enhanced speed and endurance. What’s more, there are plenty of characters besides T’Challa to love (and love to hate) in the wonderful world of Wakana. Black Panther action figurines pay tribute to all of T’Challa’s powers and his heroic nature, and the friends and foes who help tell Wakanda’s amazing story. Check out some of the best Black Panther action figures that are available today, and get ready to add some much needed color to your superhero collection. Wakanda Forever! 6-INCH SCALE COLLECTIBLE BLACK PANTHER FIGURE - Wakanda forever! T'Challa suits up as the Black Panther to defend Wakanda and protect the world from Thanos' evil plans. Imagine the Wakandan hero battling alongside Iron Man, Captain America, Thor, Spider-Man, and the other Avengers with this 6-inch scale Black Panther figure. PREMIUM ARTICULATION AND DETAILING - Featuring multiple points of articulation for high poseability, fans and collectors can display the Marvel Avengers Legends Series Black Panther figure in their action figure and vehicle collection to recreate scenes from Marvel entertainment and comics. 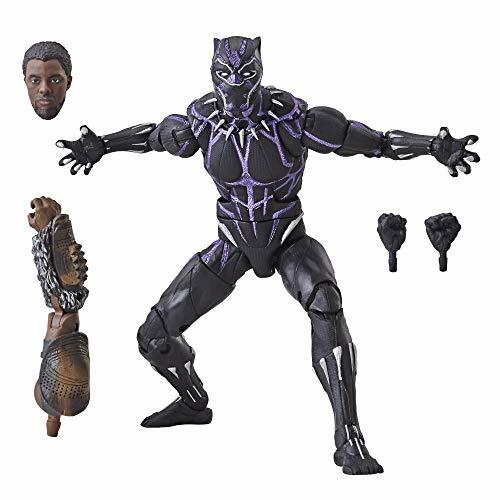 MOVIE-BASED CHARACTER-INSPIRED ACCESSORIES - This Marvel Legends Series action figure includes Black Panther-inspired alternate head and hand accessories that make a great addition to any Marvel Legends Series collection. 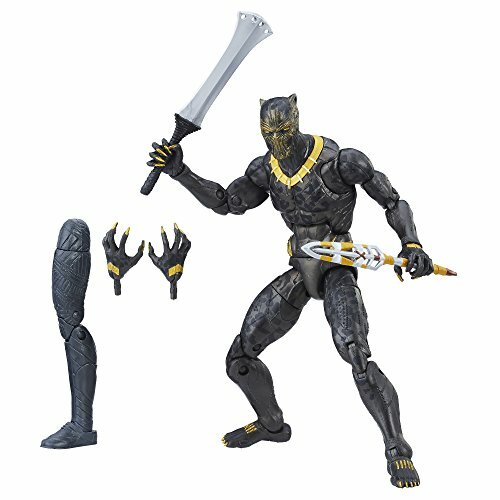 Kids and fans alike can appreciate the Wakandan warrior-king and imagine the action-packed scenes of the Marvel Universe and Avengers: Infinity War with this premium Black Panther figure featuring Vibranium detailing, inspired by the character from the Marvel Cinematic Universe that includes the Black Panther movie. T’Challa is inseparable from his superhero alter ego, the Black Panther. Get yourself a figurine that pays homage to both with the Marvel Legends figure, with both T’Challa and masked Black Panther heads. No superhero movie is complete without a supervillain. You can pay tribute to Black Panther’s love to hate villain with this Erik Killmonger figurine. 6-INCH SCALE COLLECTIBLE ERIK KILLMONGER FIGURE - Erik Killmonger seeks vengeance against T'Challa for the sins of T'Chaka. Imagine the skilled fighter battling against Black Panther in the same movie universe as Iron Man, Thor, Captain America, Spider-Man, and the other Avengers with this 6-inch scale Erik Killmonger figure. 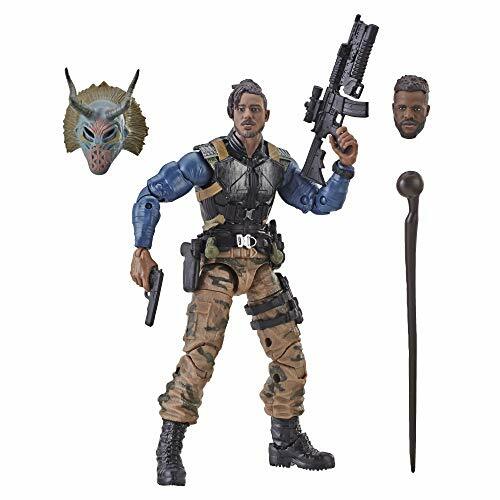 MOVIE-BASED CHARACTER-INSPIRED ACCESSORIES - This Marvel Legends Series action figure includes Erik Killmonger-inspired mask, pistol, rifle, spear, and axe accessories that make a great addition to any Marvel Legends Series collection. Kids and fans alike can appreciate the military-trained assassin and imagine the action-packed scenes of the Black Panther movie with this premium Erik Killmonger figure. PREMIUM ARTICULATION AND DETAILING - Featuring multiple points of articulation for high poseability, fans and collectors can display the Marvel Legends Series Erik Killmonger figure in their action figure and vehicle collection to recreate scenes from Marvel entertainment and comics. MARVEL UNIVERSE IN 6-INCH SCALE - Look for other Marvel Legends Series figures (each sold separately) with comic- and movie-inspired characters from the Marvel Universe, including Black Panther, Captain America, Thor, Iron Man, Spider-Man, the Avengers, and more, to build a Marvel Legends figure collection worthy of recognition. (Additional figures each sold separately. Subject to availability). Erik Killmonger is twice as scary when he is rocking his Killmonger mask, so make sure you grab this figurine with the mask included. 6-INCH SCALE COLLECTIBLE DORA MILAJE FIGURE - Wakanda forever! Members of the Dora Milaje prepare for battle alongside their king, T'Challa, to defend Wakanda and protect the world from Thanos' evil plans. Imagine the fierce female warriors battling alongside Captain America, Iron Man, Thor, Spider-Man and the other Avengers with this 6-inch scale Dora Milaje figure. PREMIUM ARTICULATION AND DETAILING - Featuring multiple points of articulation for high poseability, fans and collectors can display the Marvel Legends Series Dora Milaje figure in their action figure and vehicle collection to recreate scenes from Marvel entertainment and comics. 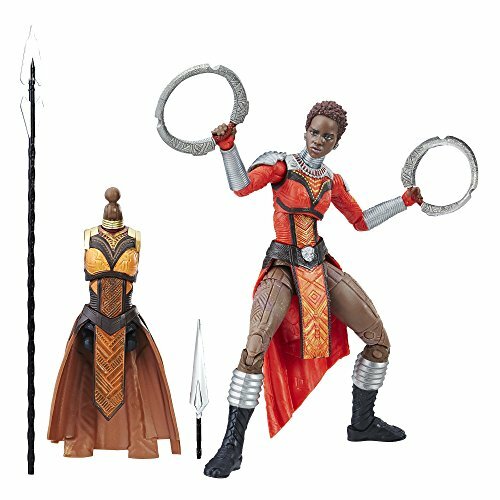 MOVIE-BASED CHARACTER-INSPIRED ACCESSORIES - This Marvel Legends Series action figure includes Dora Milaje-inspired alternate heads, rings, long spear, and short spear accessories that make a great addition to any Marvel Legends Series collection. 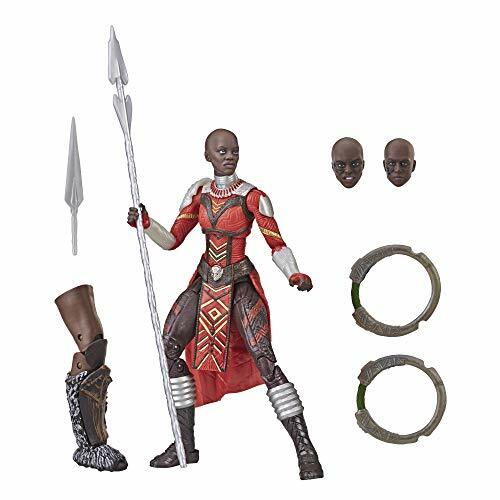 Kids and fans alike can appreciate the Wakandan female warrior and imagine the action-packed scenes of the Marvel Universe and Avengers: Infinity War with this premium Dora Milaje figure, inspired by the character from the Marvel Cinematic Universe that includes the Black Panther movie. Even superheroes need help sometimes. T’Challa would not have gotten very far without help from the Dora Milaje tribe. Who run the world? Black girls. No superhero story is complete without a complicated love interest, and it would be difficult to find a girlfriend for T’Challa more complicated than the powerful and lovely Nakia. 6-INCH SCALE COLLECTIBLE T'CHAKA FIGURE - T'Chaka protects Wakanda as the Black Panther. Imagine the Wakandan king and protector battling in the same universe as Captain America, Iron Man, Thor, Spider-Man, and the other Avengers with this 6-inch scale T'Chaka figure. 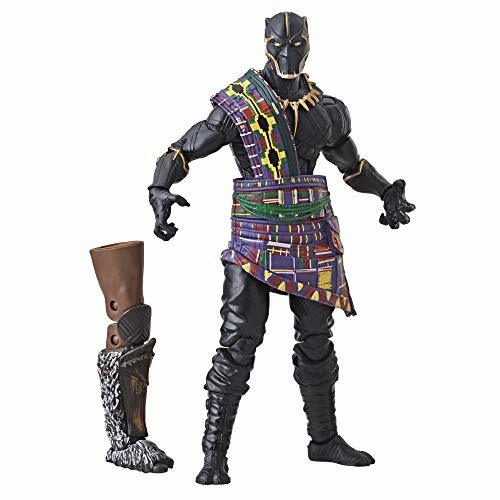 MOVIE-BASED CHARACTER-INSPIRED ACCESSORIES - This Marvel Legends Series action figure includes T'Chaka-inspired alternate hand accessories that make a great addition to any Marvel Legends Series collection. Kids and fans alike can appreciate the Wakandan hero and imagine the action-packed scenes of the Marvel Universe with this premium T'Chaka figure, inspired by the Black Panther movie. PREMIUM ARTICULATION AND DETAILING - Featuring multiple points of articulation for high poseability, fans and collectors can display the Marvel Legends Series T'Chaka figure in their action figure and vehicle collection to recreate scenes from Marvel entertainment and comics. T’Chaka is the original Black Panther, whose mantle T’Challa must take up to protect and defend the Wakandan people. Give some historical contest to your action figurine collection with this figure of the Black Panther’s father. 6-INCH SCALE COLLECTIBLE ULYSSES KLAUE FIGURE - Ulysses Klaue, driven by greed, sees Wakanda as merely a means to a supply of Vibranium and wealth. Imagine the arms dealer joining forces with Erik Killmonger in the same movie universe as Iron Man, Thor, Spider-Man, Captain America, and the other Avengers with this 6-inch scale Ulysses Klaue figure. PREMIUM ARTICULATION AND DETAILING - Featuring multiple points of articulation for high poseability, fans and collectors can display the Marvel Legends Series Ulysses Klaue figure in their action figure and vehicle collection to recreate scenes from Marvel entertainment and comics. 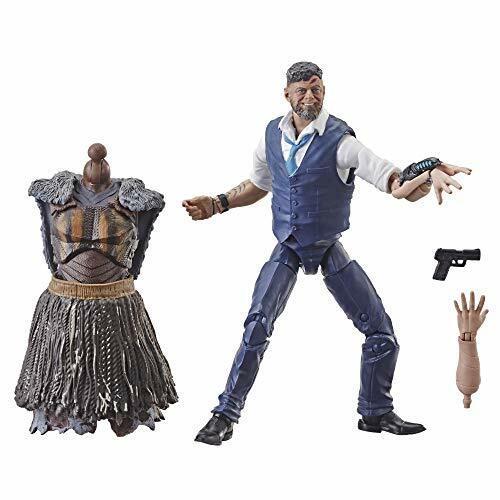 MOVIE-BASED CHARACTER-INSPIRED ACCESSORIES - This Marvel Legends Series action figure includes Ulysses Klaue-inspired alternate left arm and pistol accessories that make a great addition to any Marvel Legends Series collection. Kids and fans alike can appreciate the subversive criminal and imagine the action-packed scenes of the Marvel Universe and the Black Panther movie with this premium Ulysses Klaue figure, inspired by the character from the Marvel Cinematic Universe that includes the Black Panther movie. Some may say Ulysses Klaue is even worse than Erik Killmonger. Leave no supervillain behind by adding this dastardly character to your action figurine collection.